Thuja occidentalis smaragd is the most popular species for adding a structured formal look to any landscaped area. These slow growing cone shaped evergreen conifers are great screening plants growing to 6m over time depending on species and conditions. Tis is a plant that prefers full sun where it will grow with a nice dense habit they will grow in part shade, however foliage tends to be a little less dense. Foliage turns to a bronze / green in colder areas during winter. Use the plant as a tall evergreen hedge. Space at around 1m for a dense hedge in landscaping applications. When planted in shade the growth habit will be more open than if planted in full sun. Also useful as a feature plant, or punctuation mark in landscape design. The common name of for Thuja occidentalis smaragd comes from the dutch word smaragd, which means emerald. Can be pruned to maintain shape and size. Best pruned in early spring to give new growth a chance to harden off before summer. Fertilize and water after pruning. Grows well in colder climates and will cope with dry summers after it is well established. 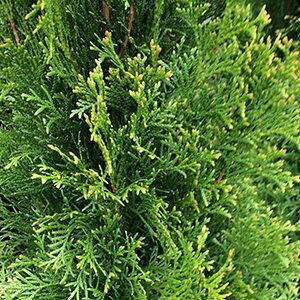 Common Name – Emerald Green Cedar. Growth rate – Slow to moderate. Soil – Tolerant of most soil types, well drained is important. Growth habit – Upright and conical.